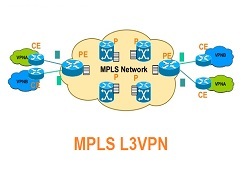 In this lab from the scratch we will implement fully working MPLS core with Layer 3 VPN and MP-BGP vpnv4 on the provider edge routers. Also we will achieve full connectivity between customers edge routers with routing protocols. At the end we will find out how to implement “extranets” and “shared services”, thanks to which we will be able to share for example Internet for MPLS Layer3 VPN customers, still keeping their networks separately. First of all, this lab I made based on very good MPLS course from Joe Astorino #24347. I only put all lessons together as a GNS3vm lab. Before you go over the lab configuration I recommend reading articles about MPLS ,MP-BGP and BGP as well, that you find a lot at www.itbundle.net. Topology that we will be using looks in this way. This is the final look, of course we wil start from the scratch. Between routers R2-R3-R4-R5 we will implement MPLS. Between routers R2-R5 we use MP-BGP vpnv4. Routers CustomerA1-A2 and CustomerB1-B2 belong to 2 different routing domains (VRFs) and are invisible for each other. There are only configured interfaces according to the screenshot, also OSPF has been deployed between R2-R3-R4-R5. In case of R7 and R8 CUSTOMER-B routers we implement EIGRP and redistribute its into BGP. It doesn’t matter what EIGRP AS we will choose on the PE routers. Again we configure EIGRP under ‘address-family ipv4 vrf CUSTOMER-B’ in case of BGP and EIGRP as well. Firstly we configure EIGRP on the CE and PE routers , then we redistribute EIGRP into BGP 2345 (vpnv4) and BGP 2345 into EIGRP. This way we achieve full connectivity between CE Customer-B routers. configuration of Shared Services router. We implement route leaking with import-export betwen VRFs if we have any shared services (common server, netflow collector, access to the Internet). Also new VRF called Shared has been created and interface faced to Shared Services router has been assign to its.Route leads to 11.11.11.11 has been redistributed into BGP in order to share its with Customer-A and Customer-B VRFs. Also static routes have been added to Share Services router towards endpoints.